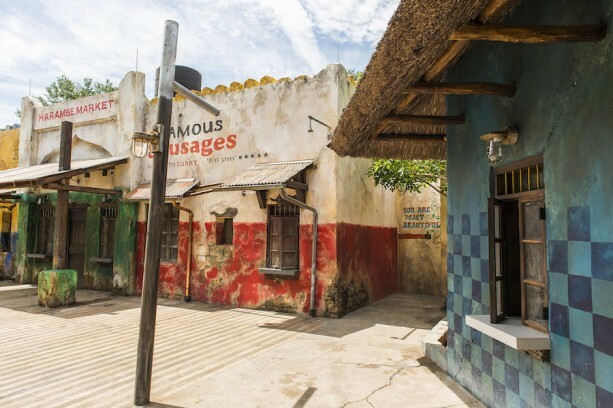 The much-anticipated Harambe Market opens late May at Disney’s Animal Kingdom, where food plays a starring role with African-inspired street food at four walk-up windows and plenty of shaded seating – 200+ seats. Built around a Colonial-era train depot design complete with a 1960s water tower, the marketplace re-creates a bustling center of commerce where guests are welcomed from around the world who have come to visit the little seaside town and venture out to the reserve to observe Africa’s animals. Chef Lenny DeGeorge led the Food and Beverage concept development team, and tells us it’s the sort of food you’d find in a street market in Africa. “The menus reflect the unique personalities of the establishments’ owners,” says Chef Lenny. 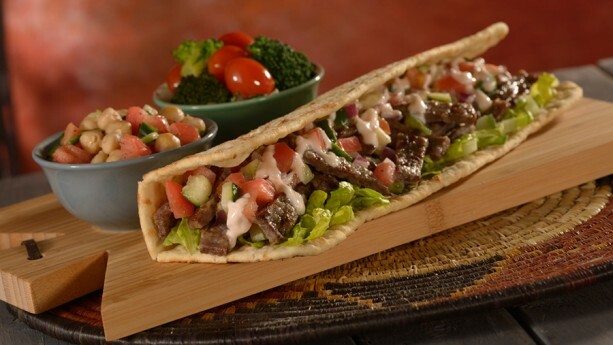 “Kitamu Grill” offers skewered chicken and a kabob flatbread sandwich. “Famous Sausages” features a corn dog, inspired by a South African sausage called a boerewors, dipped in curry-infused corn batter. “Chef Mwanga’s” serves a spice-rubbed karubi rib with green papaya-carrot slaw. “With three meaty ribs, the karubi rib is our version of the giant turkey legs served in the Disney theme parks,” says DeGeorge. We give two thumbs up to the curry corn dog, made with a special spiced sausage inspired by the traditional boerewors. A fourth window, called Wanjohi Refreshments (“wanjohi” means “brewer” in Swahili) offers beverages including six South African wines by the glass; Safari Amber Lager and Orlando Brewing I-4 IPA on draft; red sangria with Van der Hum tangerine liqueur from South Africa; The Starr of Harambe, a frozen drink with Starr African rum with mango puree in a souvenir mug; non-alcoholic tangerine lemonade, and fountain beverages including Sparberry from Zimbabwe and Bibo from South Africa. With shaded tables and merchandise shops, the new market, together with the recently opened Harambe Theatre (home to “Festival of the Lion King”) doubles the size of the original Harambe Village.